Dessert for breakfast! 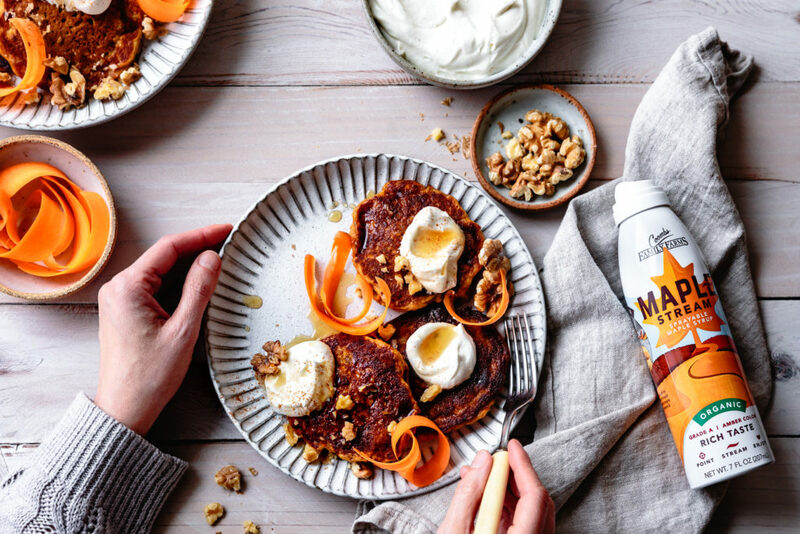 These healthfully decadent carrot cake pancakes are loaded with grated carrots, walnuts, hearty oat flour, and spices, and they’re naturally gluten-free to boot. Don’t forget to pass the maple stream at the table for extra maple goodness. In a large bowl, whisk together the egg, maple syrup, buttermilk, oil, and vanilla to combine. Place a medium-mesh strainer over the bowl and sift in the oat flour, sweet rice flour, baking powder, baking soda, salt, cinnamon, and ginger. Stir to combine. Heat a griddle or wide skillet over medium-low heat. When the pan is hot, coat with a thin film of oil. Drop the batter by 1/3 cups onto the hot griddle, spacing them well apart. Cook until golden on the bottom and bubbling on top, 2-3 minutes. Flip and cook on the second side until golden on the bottom and mostly cooked through, 2-3 more minutes. If the pan becomes too hot, lower the heat. The cakes will continue to cook from residual heat when removed from the pan. Place the pancakes on a wire rack in a low oven to keep warm if you like. Meanwhile, combine the mascarpone, cream, maple syrup, and vanilla in the bowl of a stand mixer fitted with the whip attachment (or use a large bowl and a whisk or electric beater). Whip on high speed until the mixture mounds softly, 1-2 minutes. Chill until needed. Top the pancakes with whipped mascarpone, walnuts, cinnamon, and shaved carrots, passing the maple stream at the table.